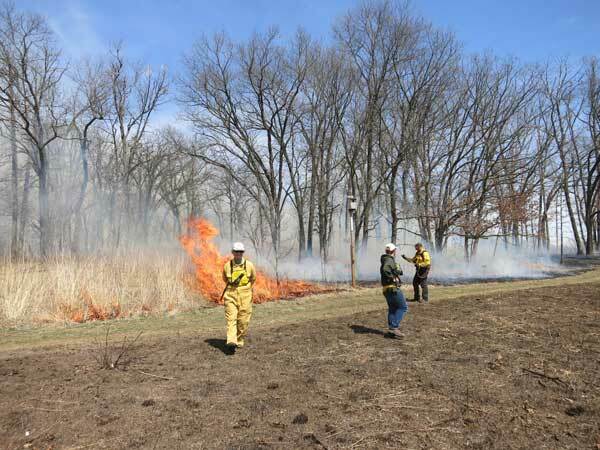 We did savanna/prairie/wetland burns on Tuesday March 29, 2016. These were the last burns of the spring burn season. The other burns were done on March 11 and March 21. This is the earliest we have ever finished our burns. This year they were mostly done on fairly cool days when there was a high pressure air mass over the area. Temperatures never got above 60, RH generally in the 40s, wind moderate. 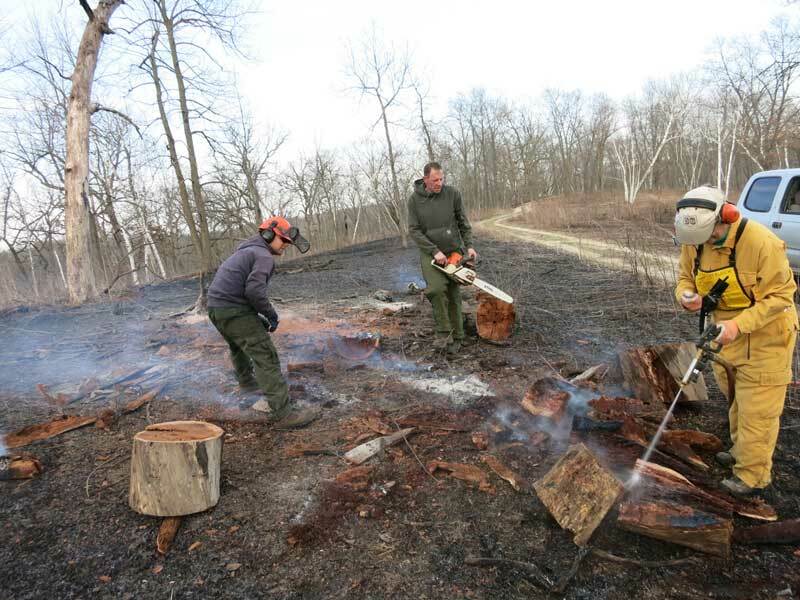 The new burn permitting program established this year by Wisconsin DNR Forestry worked very well. Today the wind was out of the south or east, gusting to 7-8 mph. RH got down to about 40 in mid afternoon, but there was dew on the grass in morning with a temperature of 31 F.
Burn crew: Amanda and Susan from PVC; Kathie and Tom as volunteers; Craig Annen, Chris Knief, Sean Logenbaugh, and Jared Bland from Integrated Restorations; 8 people in all. Kathie and Tom ran the pumper unit. Download this map (PDF) which shows all the burns and all the units. 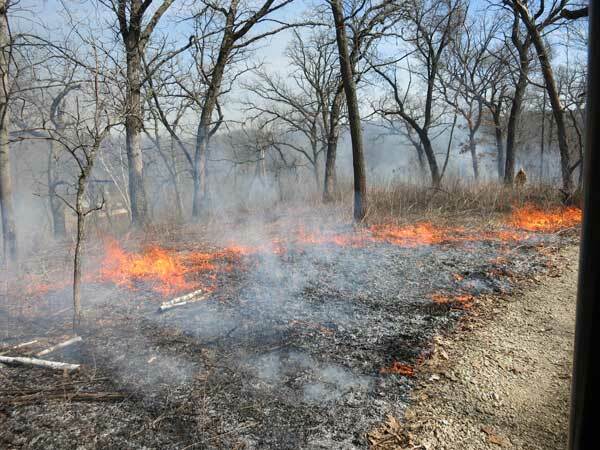 Long-narrow savanna burn: Because the wind was out of the SE, we started lighting at the west end of Unit 19. This is a long narrow savanna of about 5 acres that is situated between the ridge-top savanna and the north woods. The North Firebreak separates this unit from the big woods. 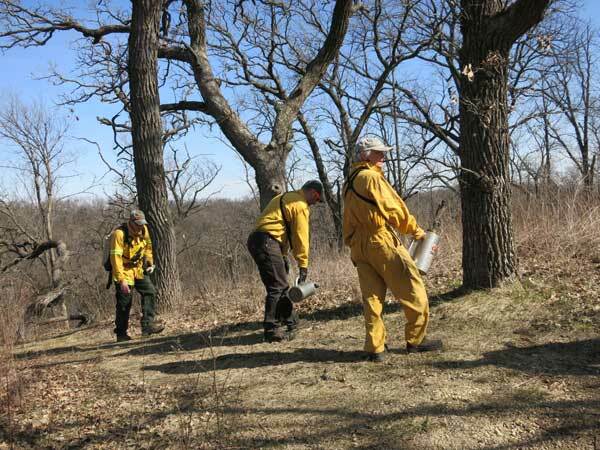 To protect the North woods, lighting began on the NW corner, with one drip torch and several waters along the North Firebreak and a second drip torch doing interior lighting around special trees to be protected. [I will have a discussion of tree-centered burning in an upcoming blog post.] The north line moved first. Because of the long burn line, and the need to protect trees, this burn moved fairly slowly and probably took most of an hour to do. Close to the end of the narrow savanna. The smoke in the distance is from the line on the North fire break. 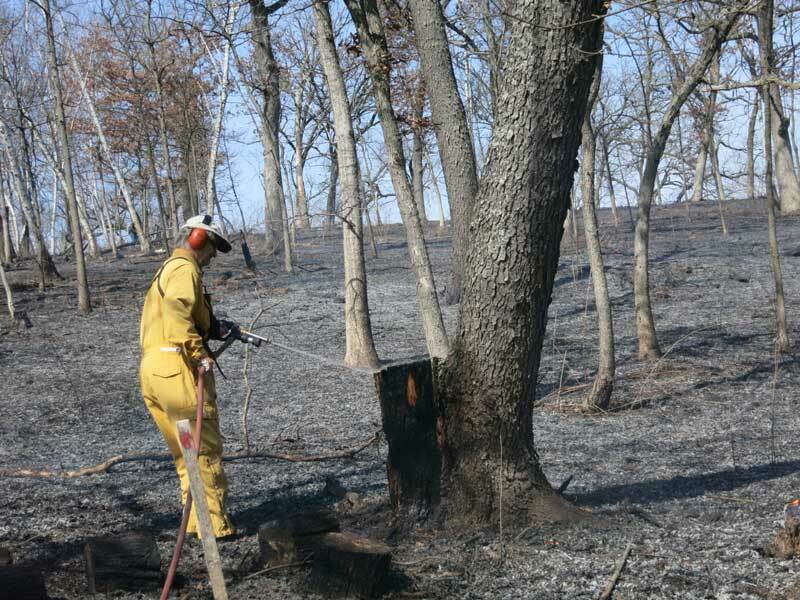 Using the pumper unit to put out the fire on a dead stump next to a living white oak. Because of the large amount of wood in this savanna, there is often a lot of mop-up. Note that this whole unit is black, indicating a satisfactory burn. 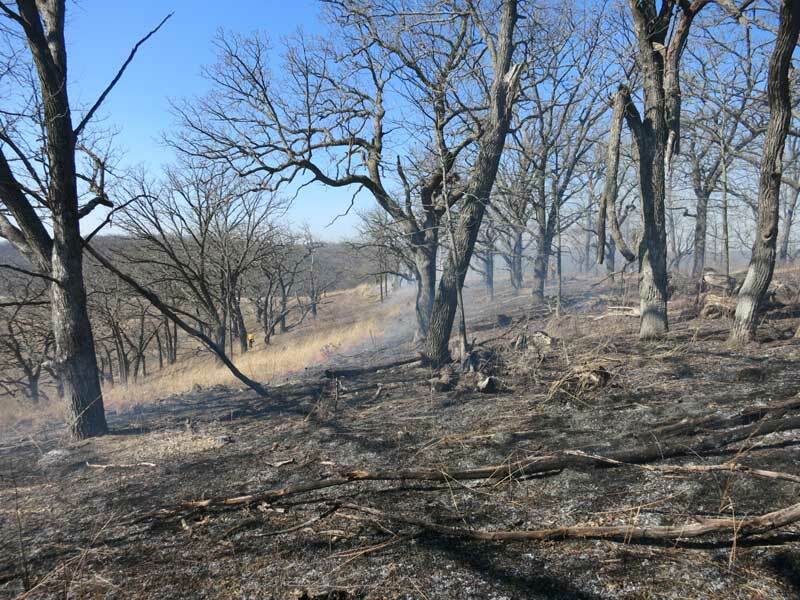 Prairie/oak-woodland burn: Once this savanna area was secured, we moved on to Toby’s Prairie and the Woodland Extension which extends into the North woods. Lighting began at the NW corner of the Woodland Extension and moved east along the edge of the woods. A second drip torch did interior lighting along the N edge of Toby’s once the Woodland Extension black line was secure. This was done in order to speed up the burn, although the Woodland Extension burn would probably have eventually reached and started Toby’s on fire. The line running along the N of Woodland Extension moved into Unit 13B and then up (south) along the edge of the Conservancy property. 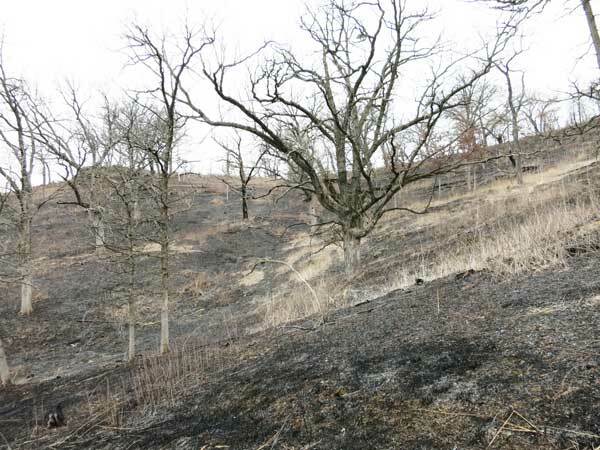 The second drip torch from this line did some interior lighting in north of Toby's Prairie and eventually lighted the Triangle (a savanna remnant), starting at the small ravine between the Triangle and Toby’s Annex. 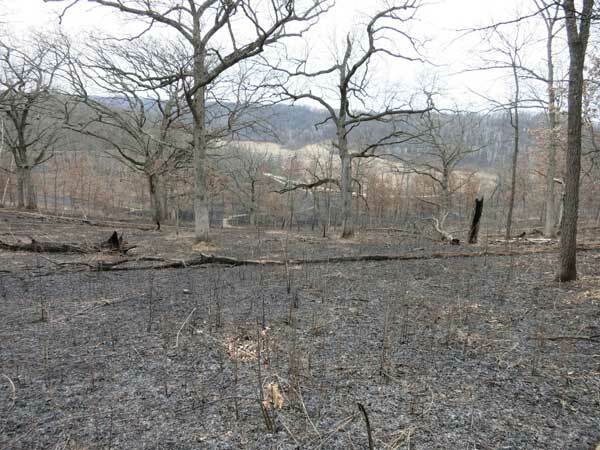 Unit 13B, which is a fairly young Hill's oak and white oak woodland (around 75 years old), burned well without much interior lighting. Stepping into the "black" to avoid the high flame height. The prairie in the foreground had been burned 3-21-2016. The visible kestrel box had been watered to prevent it from burning. The whole burn finished about 1 PM. We returned to the cabin for lunch and regrouped for the wetland burn. This wetland has some outstanding native vegetation but a firebreak is difficult to create because groundwater is often right at the surface. We try to burn as much as we can. Interesting species that we are trying to encourage include Turk's cap lily, turtlehead, swamp thistle, swamp milkweed, lousewort, stiff gentian, fringed gentian, and Liatris ligulostylis. There are also patches of the sedge Carex trichocarpa and cord grass (Spartina pectinata). Mowing the wetland firebreak with the Kubota the day before the burn. 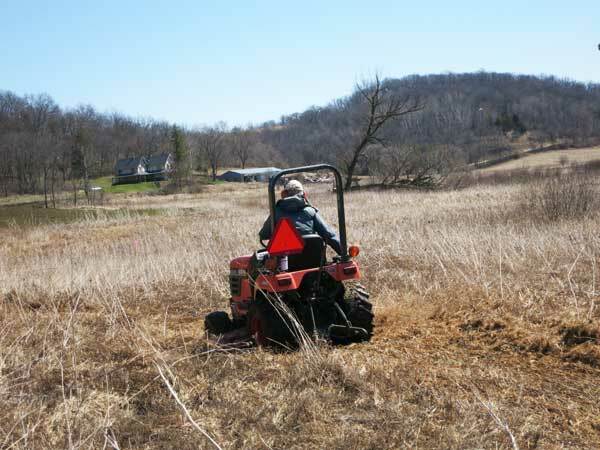 Kathie had mowed the firebreak for the wetland burn the day before (see photo). Although the terrain is difficult and often has standing water, she managed to find a path through that was OK. At no place is the area to be burned very wide, but it does widen out in a few places. Also, she managed to carry the firebreak all the way to Cty F. See the map (PDF) for the location of this wetland burn. The burn was done in two phases, from the Barn/Crane prairie NW to Cty F and from the same point SE toward the end of the Valley Prairie. Due to the predominantly E (and SE) direction of the wind, we started the burn at the kestrel house end of the Crane Prairie and moved N toward Cty F.
The whole line was wetlined using the pumper unit in the Kawasaki. In addition, there were four waters, two of whom were on the lookout for spots into the vast wetland to the south. It took about an hour to reach Cty F, with lots of wetlining and slow careful lighting. We then moved the whole crew plus the pumper back to the kestrel house and burned East. See photo below for this part of the burn. Burning the wetland. The firebreak had already been wetlined. Most of the crew was busy making sure the fire did not creep across the firebreak. What was the fuel for the wetland burn? A lot of it was probably sedge, some of which was Carex trichocarpa. Also grass and forbs. Very little, if any, cattails. A chain saw is essential for savanna burn mop-ups. This punky black oak log was a three-person job. Because it was near the edge of the burn unit, it could not be allowed to smoke. The pumper unit provided lots of high pressure water. We have been using this custom-designed pumper unit for about 10 years. It is essential for mop-up during savanna burns. The map (PDF download) gives a summary of all our spring burns, 88.5 acres. This does not include our burn of Black Earth Rettenmund Prairie, which will be the topic of another blog post. Whether its climate change or just luck, this is the earliest we have been able to complete our spring burn program. (Some years our first burn has been March 29. One year we did not do our first burn until April 4.) Note that we did not burn in really "warm" weather. However, all our fuel was lush and well-cured. When is a "forest" a savanna? I've dealt with this question briefly in earlier posts, but I am prompted to revisit it after coming across a paper with this title from an international group focused primarily in tropical savanna (the authors are from India, South Africa, Australia, North Carolina, England, and Germany). (See reference at end) I was struck that despite the completely different flora and geography, the underlying concepts were almost identical with those of our Midwest savannas. The discussion in this paper begins with what is called the "savannization" of tropical forests due to logging, often followed by fires. "While such degraded forest areas...may 'look' like savannas due to low tree cover, their functional ecology in terms of which species predominate and how these communities respond to...[disturbance] is entirely different from that of true savannas." The table here contrasts the characteristics of the savanna and forest. Table 1 Comparison of physical environments, species composition and traits of dominant tree species in savannas versus forests. One of the key characteristics is the presence of C4 grasses in the savannas, and C3 grasses in the forests. Given sufficient biomass (brought about by substantial rainfall) C4 grasses are highly flammable so that fire becomes a fundamental feature of a relatively humid (mesic) savanna. As the authors state, there is no need to distinguish between natural and anthropogenic fire, because anthropogenic fire has long replaced natural fire in almost all ecosystems. "What is important is that C4 grasses have high productivity, low decomposition rates,...and a fuel structure that readily carries fire and dries out rapidly in the dry season." Because of the association with pyrogenic C4 grasses of savanna trees, they are perforce [and have evolved to be ] highly fire-tolerant. On the other hand, under mesic conditions trees associated with C3 grasses are shade tolerant and do not tolerate fire. 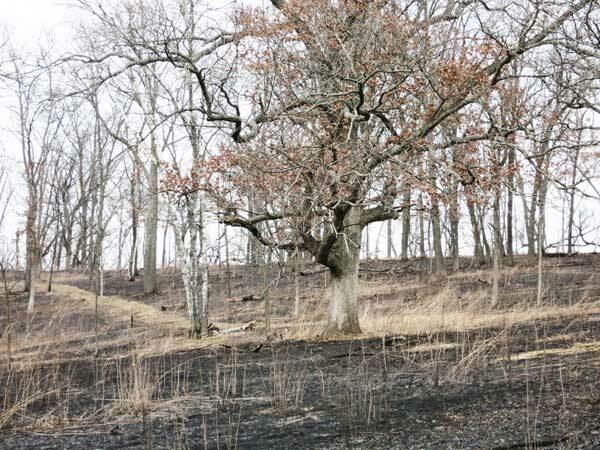 There is an exception in the Midwest here, since fire tolerant oaks are able to thrive under mesic conditions, provided fire occurs. 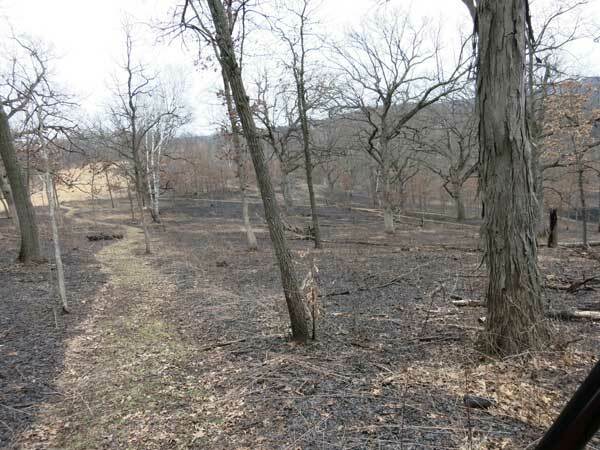 As discussed by Abrams and Nowacki, in the absent of fire in eastern North America mesophication occurs and oak forests are replaced by maple, beech, basswood, and other fire sensitive trees. The underlying concepts in Table 1 are worth detailed analysis. Ratnam, Bond, Fensham, Hoffmann, Archibald, Lehmann, Anderson, Higgins, and Sankran. 2011. When is a 'forest' a savanna, and why does it matter? Global Ecology and Biogeography 20: 653-660. On Monday March 21 2016 we had a great burn of the oak savannas at Pleasant Valley Conservancy. The next day Kathie and I returned to assess the burn coverage and take pictures. It turned out to be an excellent time to see the forest structure in all its simplicity. Before leaf out of trees and shrubs, before forbs and grass growth. The black forest floor provides an excellent contrast with the trees. 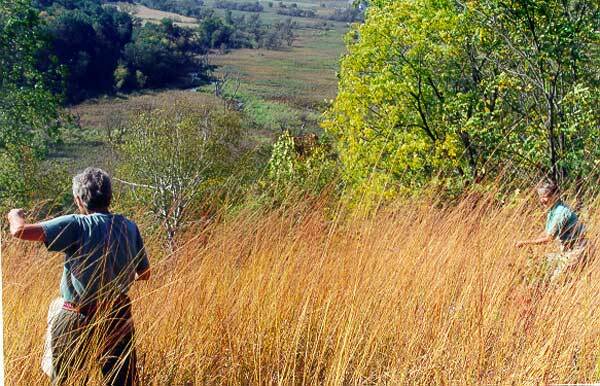 Our bur and white oak savannas are excellent examples of old-growth forests. According to the experts, in Eastern United States it takes 150 years or longer to reach old-growth character. According to our minimal evidence, our white savannas are between 150-200 years old and many of our bur oaks are older than 200 years. Incidentally, right through the middle of this savanna burn the red-headed woodpeckers remained active. And the next day they were on the ground feeding on what they could find. Also, we had a large flock of red-winged blackbirds on the ground among the black. I counted over 50 birds. A comparative survey of 1949 and present-day air photos will likely show that in our area the south- or south-west facing slopes that were once hill prairies are now red cedar (Juniperus virginiana) forests. John Curtis (Vegetation of Wisconsin), who did not have the benefit of the last 50-60 fire-free years, called these "cedar glades". Given the lack of fire since Curtis day, it is likely that all his cedar glades no longer exist and are now close-canopy cedar forests. To see an example of this sort of closed canopy cedar landscape, take a drive west on US 14 from Cross Plains to Black Earth. 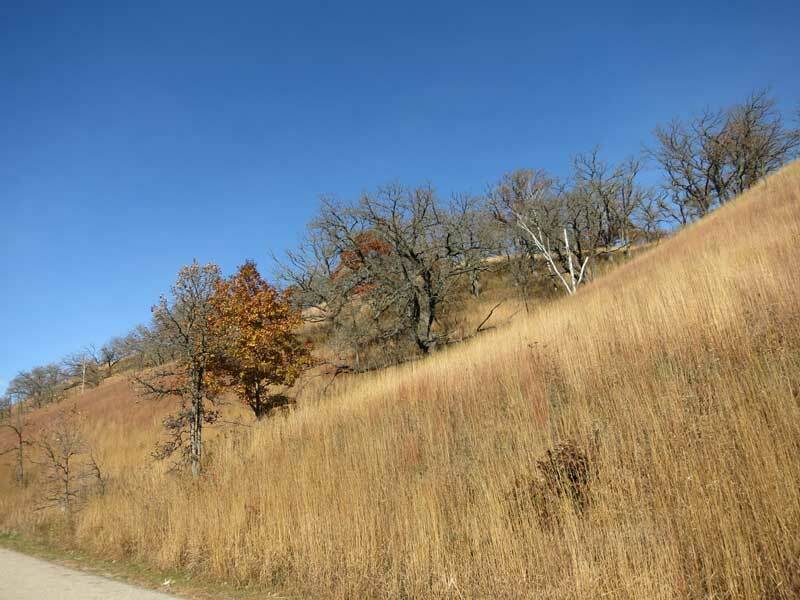 Every hill on the north side of the road (except Festge Park, which has been restored) has a dense cover of cedars in the region of the hill that was a prairie in Curtis' time. Study these cedar-covered hills and try to imagine them burning almost every year, as they almost certainly did in 1949 (or earlier). Somebody, probably the landowner, simply lit a match. However, it is interesting that today not all south- and south-west slopes have closed canopies. Some are open enough (despite lack of fire) that Curtis would still call them "glades." Initial cedar establishment is probably a random event, depending primarily on transport of seeds by birds. And some sites may be more favorable to cedar growth than others. Cedar hillside that has not yet closed in. 20 years ago this hill was completely open. 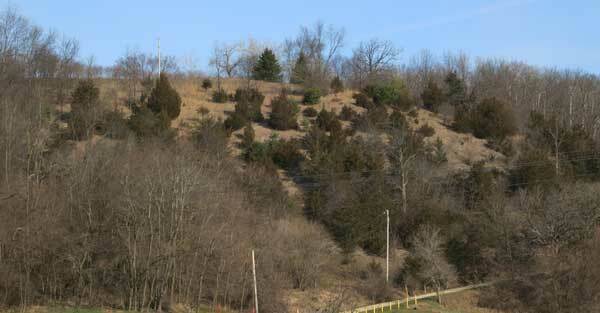 In fact, it seems that not all south- or south-facing slopes even get invaded by cedar. In some cases, other woody species such as buckthorn, honeysuckle, walnut, and or elm take over. Perhaps the soil, steepness of the slope, or the aspect differs in those hills. But most south slopes in our area are cedar covered. 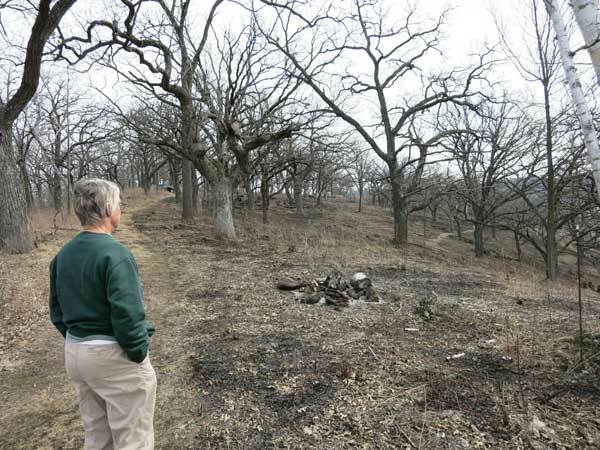 It is uncertain if a closed-canopy cedar hillside can be restored to prairie. Since the original prairies on these hillsides had probably been there since pre-settlement times, it is likely that there is still a seed bank. 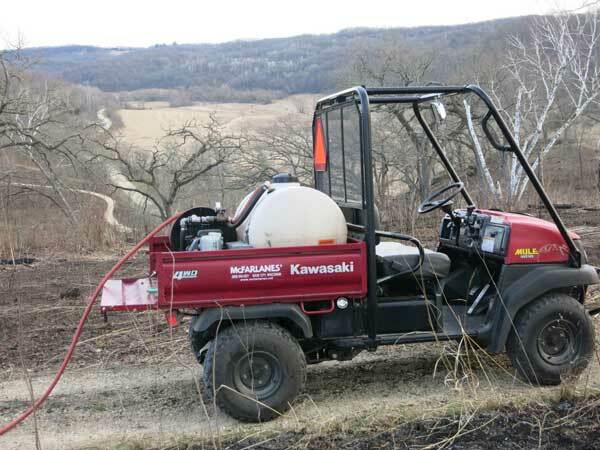 However, the initial flush of prairie growth after clearing would be from the rootstock, primarily of grasses. According to John Weaver's work in Nebraska, the rootstock of some species of grasses do not survive very long although others may survive for some years, gradually dying out. Since many of the former prairie remnants in our area have been under closed canopy and essentially in the dark for at least 50 years, it seems likely that there is little of the original prairie left. To recover prairie now will require extensive seeding. 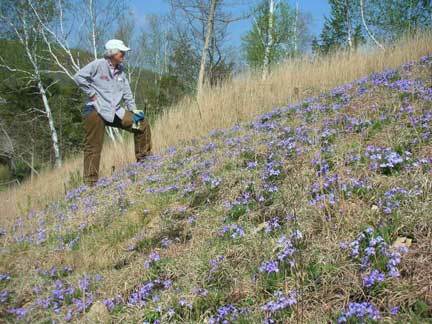 It takes a lot of effort to restore hills with closed canopy. The best example is the Nature Conservancy's Spring Green Preserve, which has been undergoing restoration since 1971 (more than 40 years!). Kathie and I participated in large work parties at Spring Green back in the late 1990s and early 2000s. Some of these involved up to 100 people, with often 7 or 8 chain saws running simultaneously. The hills are now clear and are a great example of what can be done. And the prairies on these hills have recovered surprisingly well. and flourished after the area had been burned. This photo was taken in the fall after the first burn the previous spring. 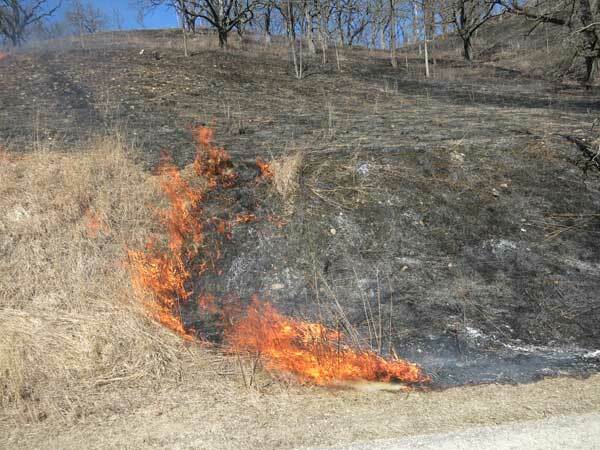 One burn is all it took to stimulate the growth of this great stand of Indian grass. Burning the south-facing slope these years is a tricky task, because the fuel is so lush. The photo shows what the slope looked like at the end of the 2015 growing season. South-facing slope in October 2015. This was a very good growing year and the fuel is very tall and flammable. 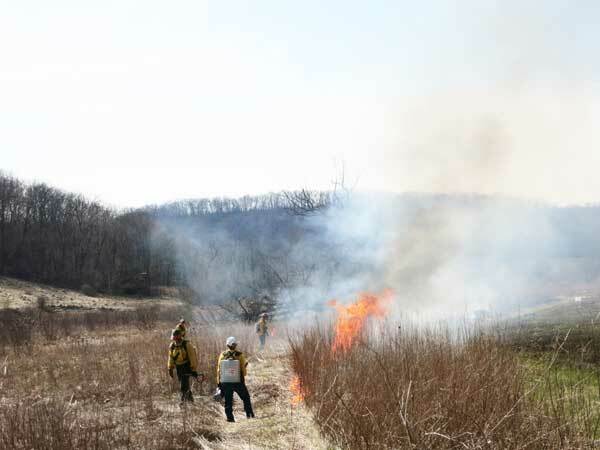 The three dominant grasses (big bluestem, little bluestem, and Indian grass) are tall and lush, very burnable, and capable of producing really high flames. Although the bur oaks are fairly fire resistant, their upper branches are quite capable of catching on fire. Mop up could therefore be a real problem. The answer is to carry out the whole burn as a backburn. The slope is steep and therefore more important than the wind, so the backburn has to start from the top. This year we had a crew of 13, mostly hired contractors, plus a few volunteers. Amanda ran the burn, as she has done the past three years. Start of the burn, 11 March 2016 at the top of the ridge. The next photo shows a later stage when most of the top of the ridge was black and the fire line was starting to move down the hill. People with drip torches were making sure that the whole line was on fire. After the whole top of the unit was on fire, and the fire breaks at both ends blackened, most of the time was taken with watching and waiting, while the backburn moved slowly down the hill. 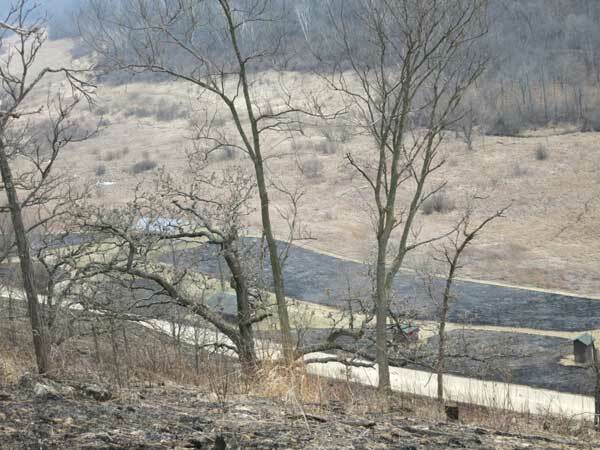 The next photo shows the fire line about half way down the hill. A later photo from the bottom of the hill shows the fire line about to put itself out as it runs out of fuel. Most of the later stages of the burn occurred while the burn crew ate lunch, because there was nothing to do but wait. Fire about to put itself out at the bottom of the hill. 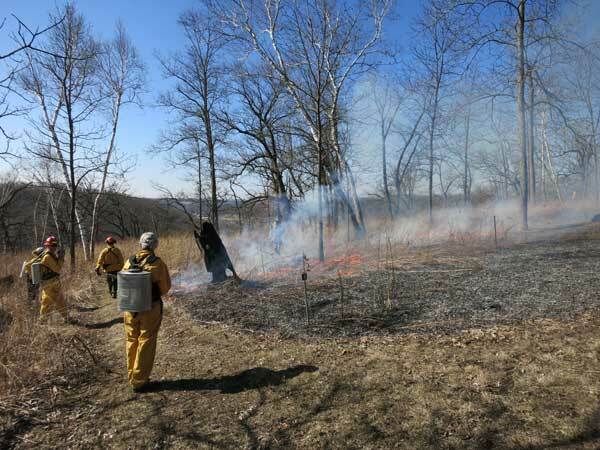 After lunch we burned all the planted prairies that were adjacent to Pleasant Valley Road. These burns took place fairly quickly, as they were burned as conventional prairie burns, ending mostly as spectacular head fires. The next photo is a view from the top of the ridge the next day, showing the black south slope and a couple of the planted prairies. View from the top of the ridge showing several planted prairies that had been burned taken the day after the burn. The final photo shows another view from the top, the day after the burn. Although this was not a large burn, it was a complicated one. Because we are burning through an old-growth forest, with many venerable trees, we are especially careful to protect their branches from catching on fire. In all, a very successful burn. 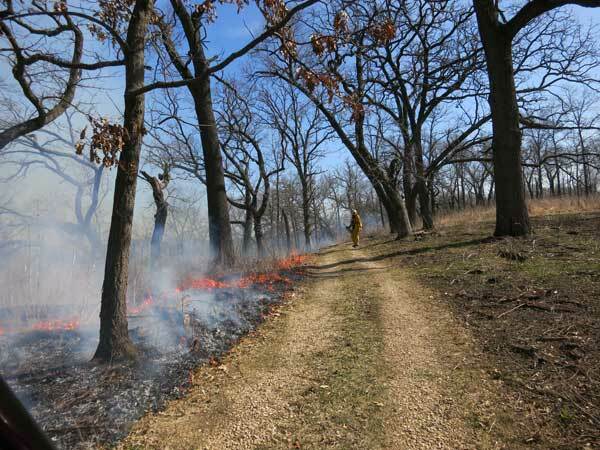 We'll be burning the rest of our ridge-top savannas as soon as conditions permit. 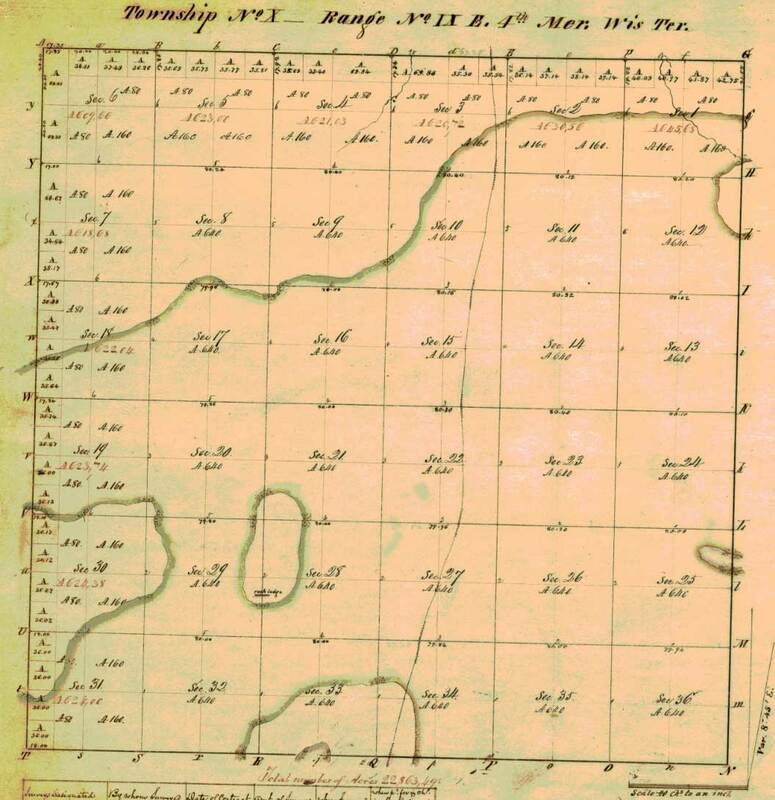 Recently I have been using the original land survey plat maps to determine in detail the size and location of the Empire Prairie. This large prairie was a vast grassland north of Lake Mendota. There are only a few prairie remnants left of this fertile land, which is now almost completely subsumed by agriculture. 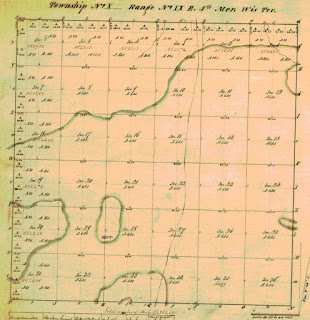 There were two products of the land survey from the 1830s and 1840s. The first was the original measurement establishing each township, section lines, corner posts and quarter posts (chains and links). The second product was a detailed plat map of each township derived from the original data. 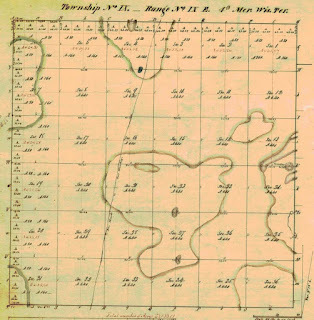 The plat maps were not done by the surveyors. 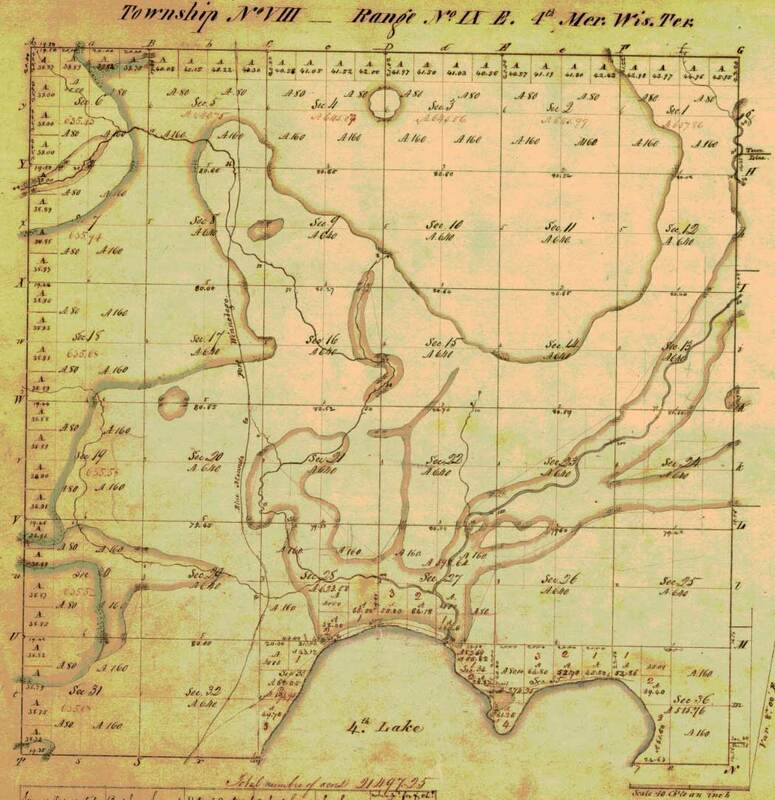 Rather, their records were transferred to the Surveyor General's Office in Cincinnati (later Dubuque), where skilled cartographers drew plat maps based on the original data. These plat maps were quite accurately drawn, and although they mention nothing about trees, they lay out the prairies precisely. Plat maps for three townships (Arlington, Vienna, and Westport) that contain lots of pieces of the Empire Prairie are shown below. 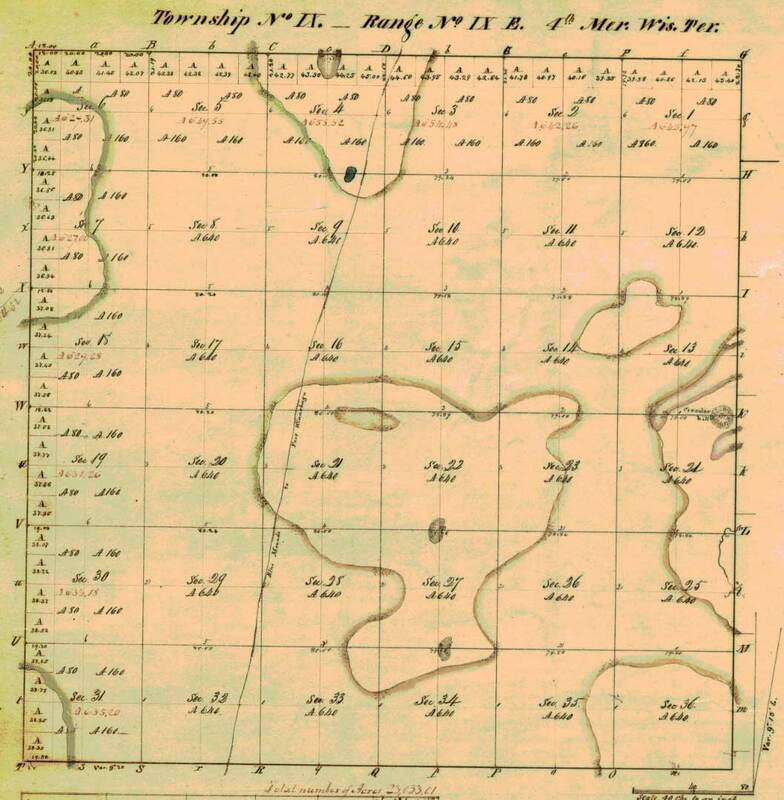 All of the surveyor's notes and plat maps are available online, via the Wisconsin Cartographer's Office (WCO). I downloaded the relevant plat maps and brought them into Photoshop so that the handwritten notes etc. that were outside the township boundaries could be deleted. I then brought each image into GIS (ArcMap 10.2) and georeferenced it against a township shape file obtained from WCO. The prairie boundaries on each township plat map lined up fairly accurately with the boundary in the next township. I also used a Basemap layer obtained from ArcGIS Online, which provided township names and section numbers, as well as roads, municipalities, and water bodies. Once all 14 townships that had parts of the Empire Prairie had been loaded, I proceeded to draw the outlines of the prairie. I created a single polygon that spanned all 14 townships. There were a few parcels within the prairie that were oak savanna, and these had been outlined by the cartographer. They are shown on the final map as inserts. Finally, I located existing prairie remnants and located them on the map, using the topographic Basemap and 2010 air photos for the counties of Dane and Columbia. 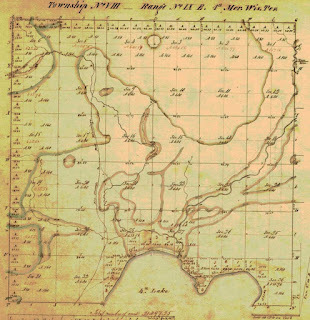 These remnants are shown as stars on the map, and their names are given in the table. How close is my estimate to the historical data. The Empire Prairie was sometimes called the "twenty-mile prairie", since it was about 20 miles across. Since each township is 6 miles on a side, it is easy to see that 20 miles is not too far off. My map shows that the prairie runs in a southwest/northeast direction. This seems reasonable, since the prevailing winds are from the west, and Lake Mendota blocks the whole south side from fire. The existing prairie remnants are very tiny. Some are only a few acres and the largest (Westport Drumlin) is only about 16 acres. Obviously very little prairie is left. It is impressive that much of this remnant prairie has maintained itself with very little restoration work, or even very few burns. The vertical line across the middle is the route of the Military Road (Blue Mounds to Fort Winnebago; now Portage). Goose Pond is the feature in Section 25 (extends east into Leeds Township). Note how the Military Road line connects to that of Arlington. This simplified map (GIF format) is to permit fast downloading. A much larger version with roads, contours, and other features is available and can be provided. For a nice cultural history of the Empire Prairie, see the following publication: Martha S. Engel and Andrew W. Hopkins. 1956. The Prairie and Its People. Bulletin 520, Agricultural Experiment Station, University of Wisconsin, Madison.